South Korea's Cho Gwang-hee defended his Asian Games gold medal in the men's kayak single (K1) 200-meter race Saturday. 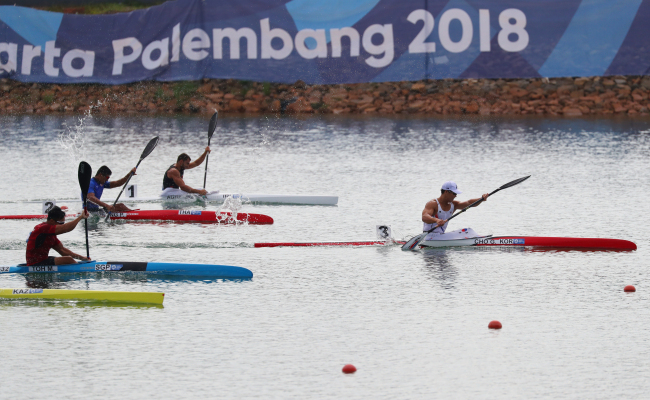 Cho finished the race in 35.373 seconds at Jakabaring Rowing & Canoeing Regatta Course in Palembang, the co-host city of the Asian Games with Jakarta. Cho edged out Sergii Tokarnytskyi of Kazakhstan by 0.372 second. Yingjie Mervyn Toh of Singapore took the bronze medal at 36.314 seconds. Cho earlier won silver in the men's K4 500m in Palembang. Kayak races are canoeing disciplines. Cho is the first South Korean athlete to win back-to-back canoeing gold medals.